The Samsung Gear Fit 2 is a well-round fitness tracker that's more than the sum of its parts. Its integrated GPS and heart-rate sensor are both on point, while its sizeable screen is both beautiful and responsive. Between the Gear S3 Frontier and the Gear IconX smart headphones Samsung already has a healthy collection of wearable tech to hand. The Samsung Gear Fit 2, however, is something different. Not just from what Samsung has on offer, but different from the rest of the market too. An activity tracker first and foremost, it echoes the likes of the Fitbit Blaze and Garmin Forerunner 35 in pairing a fitness focus with more traditional smartwatch skills. What sets this run-tracking, music-controlling, notification-pushing device apart, however, is its look. There's no squares or circles here, instead the Samsung Gear Fit 2 has gone big on the gorgeous display front by wrapping it around your wrist. It's an impactful, elegant look, that's for sure. But is it the runner's choice? The Samsung Gear Fit 2 looks like a fitness tracker, albeit a luxury one. It's a good looking bit of kit, but one that goes heavy on the rubber and plastic - which you can feel. At just 24.5mm wide, the Gear Fit 2 is streamlined and will fit wrists that measure between 155mm and 210mm around. It looks similar to the Fitbit Charge 2 in its shape, although the Samsung option better curves to the natural contour of your wrist. Combine this with a body that's just 30g in weight, and you've got a device that's comfortable to wear whether you're walking to the shops or completing a lengthy trail run. Although comfortable, the Fit 2 doesn't always offer the most secure fit. A push-through button clasp lets you pick a strap notch that's right for you. These are overly spaced, however, meaning there's a good chance you'll find yourself constantly switching between notches that are a little on the loose side or slightly too tight. It's also too easy to knock the clasp open either while running or sat at a desk. Fit aside, this is an elegant, uncluttered wearable. The only distraction to its smooth form are the two physical buttons on its right hand edge. The lower down button is the home/power control, while the larger upper one is the back button. Combined with a decent sized, if unusually shaped touchscreen, these make the Gear Fit 2 a joy to navigate and control. The band is also available in a trio of colours - blue, pink and black - and can be extensively customised to your personal tastes and needs. Although the rubber strap can be removed and changed, the Gear Fit 2 uses its own proprietary clasp, so getting a replacement isn't easy and the options are severely limited. Instead, the device's customisation skills come from its software. There are nine different watch faces and designs pre-installed on the device, and dozens more available to download. Each of these faces can be customised with a firm press on the screen - allowing you tweak colours and complications, such as showing the number of steps taken or switching the clock design. These customisation options aren't quite as advanced and robust as on the Apple Watch 2, but there's enough there to suit your own personal style. Overall, while plastic and rubber might not usually fall into the category, the Gear Fit 2 actually looks and feels like a high-end device. That, however, is mostly down to its display. The Samsung Gear Fit 2 doesn't have a traditional screen and that, in this instance, is a good thing. There's no squat square or even circular panel. Instead there's a 1.5-inch curved, rectangular Super AMOLED display that wows from the off. This isn't an aggressive curve, but rather a subtle arc that mimics the shape of your wrist. Unlike curved smartphones we've seen in the past, such as the LG G Flex 2, this curve is more than a gimmick. It helps give the device a more comfortable, natural fit without making it too big or bulky. Yes, it looks a bit like the Microsoft Band of old, but it's far less rigid and uncomfortable. As well as boosting the device's design, the 1.5-inch display looks great in its own right. Thanks to the 216 x 432 pixel Super AMOLED panel used, the Gear Fit 2's screen really pops with bright, vibrant colours and deep blacks. There's not much need for extensive, detail rich graphics on such a small panel, but everything the Gear Fit 2 pushes towards your eyes looks great. It can suffer from some reflections, however, which some simpler devices won't. Compared with the similar Fitbit Charge 2, the Gear Fit 2 looks like a completely different breed of device. Despite its relatively narrow form, this rectangular panel is also easy to control, and proves highly responsive to your touch commands, even when running. Thanks to its screen alone, this wearable crosses from core fitness tracker to out-and-out smartwatch challenger. Before we get to the Gear Fit 2's fitness skills, its broader array of smartwatch-inspired features deserve a nod. Although there aren't thousands of compatible apps waiting to populate this wearable like there is with the Apple Watch or latest Android Wear devices, there's still plenty this Tizen OS-based fitness tracker offers. Pairing with your smartphone via Bluetooth 4.2, the Gear Fit 2 can double as a music-controlling, message-relaying smartwatch rival of sorts. It's call alerts are simple to read, with pre-written text alerts able to be sent with a swipe and a press if you can't accept the call. Text, email and messaging alerts are similarly elegantly presented, and although you can set your own quick responses, that's as far as the on-device replies go. Beyond being a high-tech messenger pigeon, the Gear Fit 2 can also be used to control your music without having to remove your phone from your pocket. It's not just track selection you can control from your wrist either, with volume controls and track repeat options also being bestowed on the Gear Fit 2. For those who want to leave their phone at home while running, there's an in-built music player and 4GB of internal storage (only 2GB is actually available to you), letting you store plenty of tracks on your wrist. You'll need a pair of Bluetooth headphones though as there's nowhere to physically plug in. As well as being a legitimate smartwatch rival, the Gear Fit 2 is pretty handy at keeping an eye on your regular training sessions. You don't even need to tell it what you're up to, as wrist wear will sense what activity you're up to a trigger a suitable session automatically. If you don't want to leave things to chance, and do want to add in extra features like GPS tracking, however, you can easily instigate your own running session by scrolling through the touchscreen menus. Once activated, on-device running metrics are plentiful, but not always the most accessible. Although you can see your current run time, calorie burn, distance covered, pace and heart rate, all of this information is on separate screens. The large touch panel makes swiping between these easy, but you'll still find your pace slowing slightly as you concentrate at working your way through them. We'd rather have a customisable screen option - even if it did mean smaller text for multiple metrics. And there's so much to scroll through as the Gear Fit 2 is rammed full of sensors. Most of these are spot on in terms of performance though, with the heart-rate sensor proving particularly accurate and responsive. Further bolstering the device's fitness-friendly skills set, the Fit 2's built-in GPS abilities are quick to pick up a signal and we suffered no dropouts or lost data during our testing. Running in both built up and open areas, every inch of our runs were perfectly mapped, with accurate distances and even a breakdown of our routes relayed directly on the device's screen when the session was over. Things aren't so accurate when simply walking, however. The Gear Fit 2's accelerometer-based step-counter is a bit on the generous side, regularly upping our step tally by a couple of hundred footfalls per day. You're going to want to lower your step target slightly to accommodate for this. There's another problem, too: the Gear's barometer, which is used to measure altitude and how many flights of steps you've walked up, is lousy. We were repeatedly told we'd hit our floors climbed target while walking along a perfectly flat road. Although stair sets were, for the most part, accurately counted, there's too much variance elsewhere for this to be classed as a valuable addition. So many solid activity trackers are let down by an uninspired companion app. Although the Samsung Gear Fit 2 doesn't succumb to the same pitfall, neither is it backed up by the best, most detailed software. 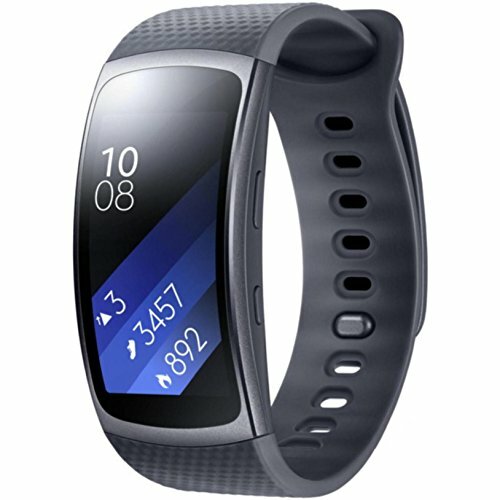 Although now compatible with iOS devices as well as Android handsets - although not as detailed for the former) - the Gear Fit 2 is a wearable best attuned to being paired with a Samsung smartphone and its accompanying Gear Fit and S Health software. S Health review: Is Samsung's smart app in the best shape? From the app you can see your daily step count mapped out as well as have detailed metrics of each run - from average heart rate to max speed - relayed in an easy-to-understand manner. Although all your fitness data is presented in a user-friendly and visually appealing way, sadly there's not much depth to your data, nor guidance on how to build up your fitness levels. Because of this, the Fit 2 is a fitness tracker that requires you to know what you're doing. Although you can see your heart rate staying high or your KM split times slowing down, there's no prompting to take a rest day. Similarly, knocking your step count out of the park on a daily basis fails to trigger a prompt to increase your targets to give yourself a more challenging goal to work towards. It's not all top-line doom and gloom though. For those who thrive on a bit of competition, you can see where your average daily step count puts you against all other Gear Fit 2 users and, if you know friends with their own device, can create your own leagues for an added motivating factor. It might not look like a traditional smartwatch, but the Gear Fit 2 has the same underpinning problem - a weak battery life. The device's battery is supposed to last you three to four days on a single charge, but you'll struggle to get near these claims. Go on a short run, keep tabs on your daily step count and enjoy regular wrist-based notifications, and you'll find yourself struggle to enter a third day without being in the battery danger zone. Although nightly charges aren't a must - that's a one-up on the likes of the Apple Watch and Moto 360 Sport at least - you'll need to connect this tracker to the mains every other evening. Fortunately that's a pleasingly simple process, despite the need for yet another bespoke charger. This is one of the better custom charging units out there. There's no bizarre crocodile clip style attachment like the Garmin Forerunner 35 or pop-out body like the Polar M200, instead, there's a small pod-like dock that you can place the Gear Fit 2 on. Magnets help snap the gadget into place, while connection pins on both sides of the charger mean you can drop the tracker on either way up and enjoy instant and speedy recharging. It's compact and not too ugly, meaning it'll happily sit on your nightstand. While it offers core tracking skills and relayed data, there's just not enough depth to its app to make it a must for serious fitness fans. So it depends where you sit on that scale. The battery life is so-so too, especially if you're often exercising. Overall the Gear Fit 2 is a great first wearable for many, while the hardened runner might want to look elsewhere. It's cheaper but not quite as flashy, the Charge 2 will be better for the fitness enthusiast thanks to its deeper app support. Better fitness tracking with still solid smart notifications comes at the cost of design details. A well-rounded alternative.